Everyone loves pizza. Therefore, logically speaking, stoners most love pizza since stoners are people (pretty sure there’s a Socratic dialogue on it). While the image of the lazy, couch-dwelling marijuana user is changing as drug laws loosen, one thing that will remain constant is the tightly woven relationship between pizza and pot. Let's face it, pizza is delicious and while high it's even more delicious (if that's even possible). It's no wonder that the same people who brought us the Push For Pizza app, that simplifies ordering a pie to just the tap of your smartphone screen, would continue to innovate in the pizza improvement space. Their recent collaboration with Nikolas Gregory studio has given us just that: a pizza box that turns into a weed pipe. It's brilliant in its sheer simplicity and function. Simply punch out a piece of the cardboard lid and roll it into a pipe shape. And you know that little plastic tee in the middle of the pizza that keeps the box from touching the cheese? Before this invention, that little doodad was only good for it's intended purpose and, perhaps, as an end table for action figures. 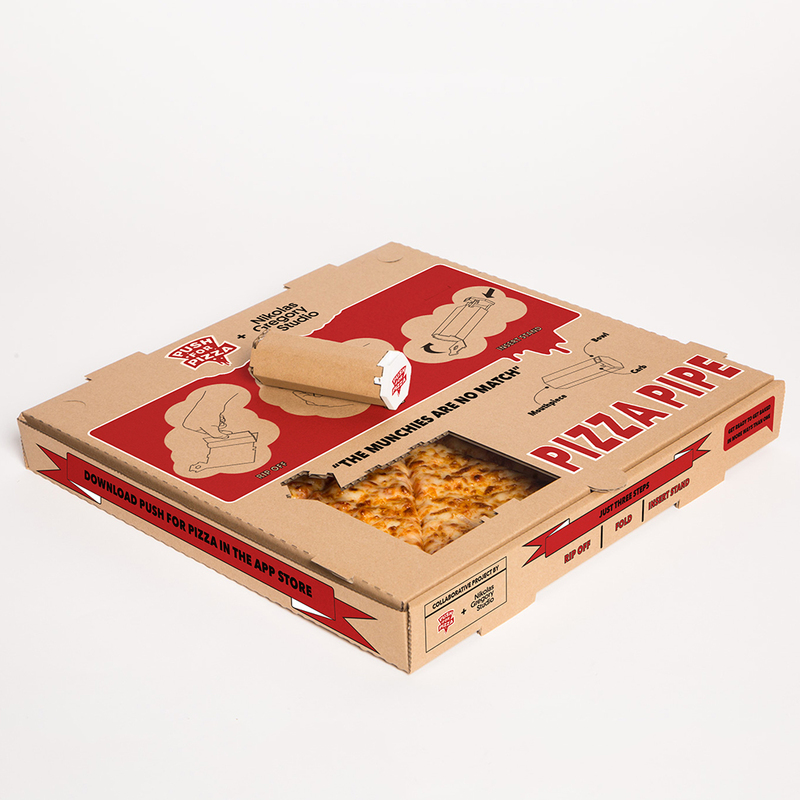 In the case of the pizza box pipe, they've designed it to plug into the end of the cardboard to create the bowl. "But what if I want to use the box to store leftovers?" you ask. Keep in mind, you'd be stoned so there won't be any leftovers. If there were a Nobel prize for achievement in munchies, surely this would win. My only question: Don't you usually order the pizza after you smoke?